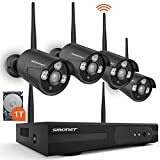 HD SECURITY CAMERA SYSTEM: Wireless CCTV System(8CH 1080P NVR Recorder+4PCS 960P Cams+1TB Hard Drive Pre-installed) is Used for Villa, Home, Office, Shop, Warehouse or elsewhere(Indoor/ Outdoor). Please Note that this is NOT Battery Powered Cameras. Wireless Camera System Doesn't Mean You can Use it without Any Cables. Power Supply still Needed to Power on the Cameras and NVR (Smonet Doesn't Take Charge of Installation). 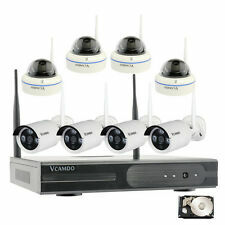 Powered by Stable Power from nearby Outlets, 24x7 hours Live Surveillance..
EXPANDABLE SYSTEM: Support to Add More Cameras. 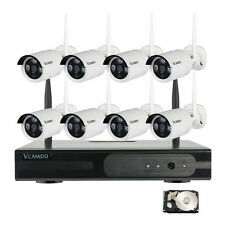 Up to 8pcs Cameras. Only Compared with SMONET 1080P or 960P IP Camera. Camera ASIN Code is B01IR4TXA8 or B01IR4TVGO. If need, Please Search Code on Amazon. 1 Year Warranty and Lifetime Free Technical Support. Provide Free Brand-new Parts for Replacement. Provide Free 10db Antenna and 10/16/30 Feet Power Extension Cable. Support E-mail: [email protected] US Toll Free: 1-866-678-0666(Available after 5:00 PM at Pacific Time)..
NVR Features: 1. 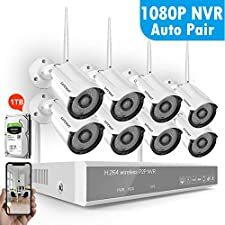 8CH 1080P Wireless NVR Pre-installed 1TB Hard Drive(Support up to 8 Cameras in Black or White Color) 2. 3520D Processor and Embedded Linux Operating System 3. Support Video Preview/Recording/Playback/USB Backup 4. Support Android/IOS/PC Remote View 5. Networking Protocol: UPNP, SMTP, PPPOE, DHCP etc. 6. 1 SATA Port, 1TB HDD Pre-installed, Up to 4TB Each, 1 USB2.0 Port 7. Power Supply Input: DC12V-2000mA, Output: 100-240V Camera Features: 1. Image Sensor: 1/4'' Color CMOS 2. Image Resolution: 1280*960P 3. Color: Black 4. Lens: 3.6mm or 4mm Lens (Random Delivery) 5. Night Vision: 65Ft (20m) 6. Minimum Illumination: 0 Lux (IR On) 7. Weatherproof: Yes 8. 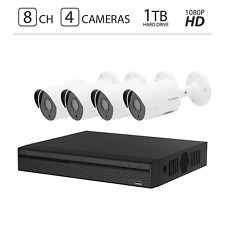 Power Supply Input: DC12V-1000mA, Output:100-240V Package: *8-Channel 1080P NVR Pre-installed 1TB Hard Drive(Support up to 8 Cameras in Black or White Color) x1 *960P Waterproof IP Cameras in Black Color x4 *Power Supply (12V-1A) for Cameras (Cable Length: 10 Feet) x4 *Power Supply(12V-2A) for NVR (Cable Length: 3.3 Feet) x1 *Network Cable (Length: 3.3 Feet) x1 *Mouse x1 *User Manual x1 *Screw Bag x1 (Be Sure to Have a TV or PC Monitor to Display Camera Picture, a VGA or HDMI Cable for Monitor Connection and a WAN Router To View Video Remotely.) Please Note, the NVR Supports 4TB HDD Maximum.The Size of Hard Drive is 3.5 inch. 2TB can Record around 25 Days. If HDD is Full, the New Recordings will Automatically Overwrite the Prior Recording. There is NO Picture if All-in-One Computer or Laptop is Connected to NVR Box Directly. Please DON'T Do That. Welcome to Enter Into Smonet Shop and Enjoy Your Wonderful Shopping!